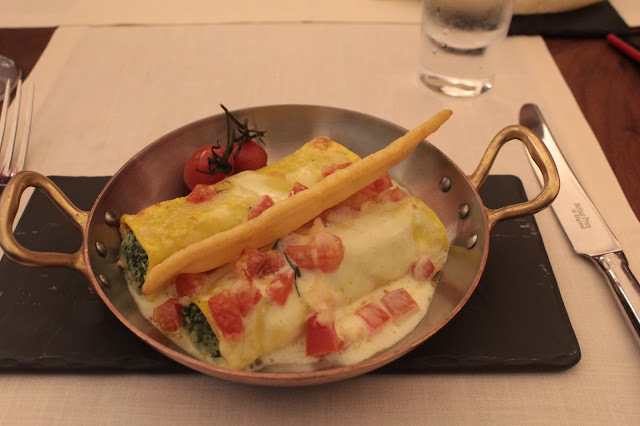 Classic Italian in every way at Villa Toscana - St. Regis, Abu Dhbai. It is grand. Luxurious. Classically opulent. As I enter St. Regis, Abu Dhabi, I stop and stare. I have been here countless times but still stand in awe every time. I the stairs, where Villa Toscana, the hotel's Italian restaurant awaits. The walk up the stairs is a slow one. One has to take it all in. While we live in a city of superlatives, few hotels boast of a lobby like this. 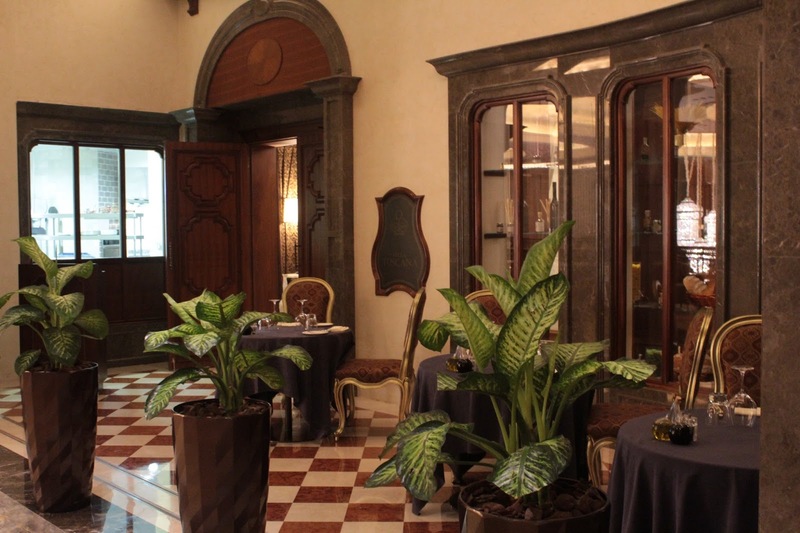 It is ironically this fine entrance, with marble dominating, that makes the entrance to Villa Toscana so special. Darker colours and abundant plants make it welcoming and remind me that I am visiting someone's villa'. Warm. 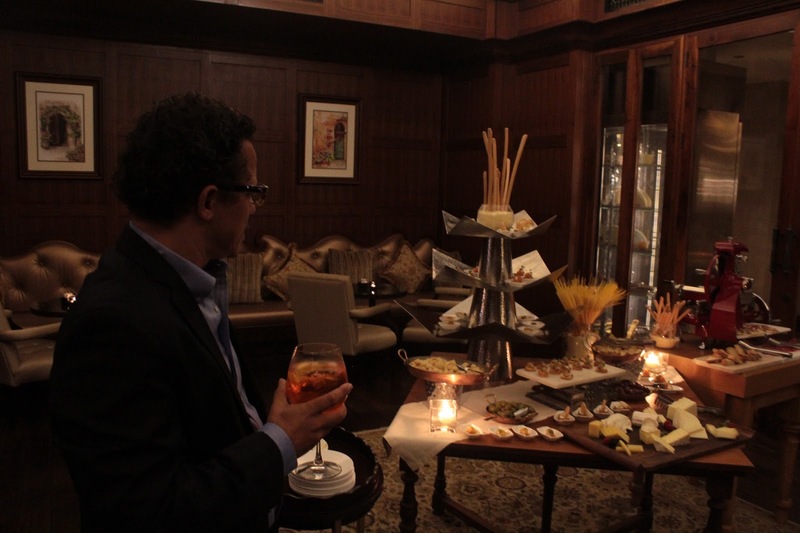 My guest and I are shown to the lavish but welcoming bar, more like a living room than anything else. The sofa seating in a very elegant setting is tremendously warm in feel and character. I like it when bars are versatile and are able to be a destination in themselves but also serve as a precursor to a dining experience. This is certainly evident here at Villa Toscana where the bar has a mouthwatering spread of antipasti. 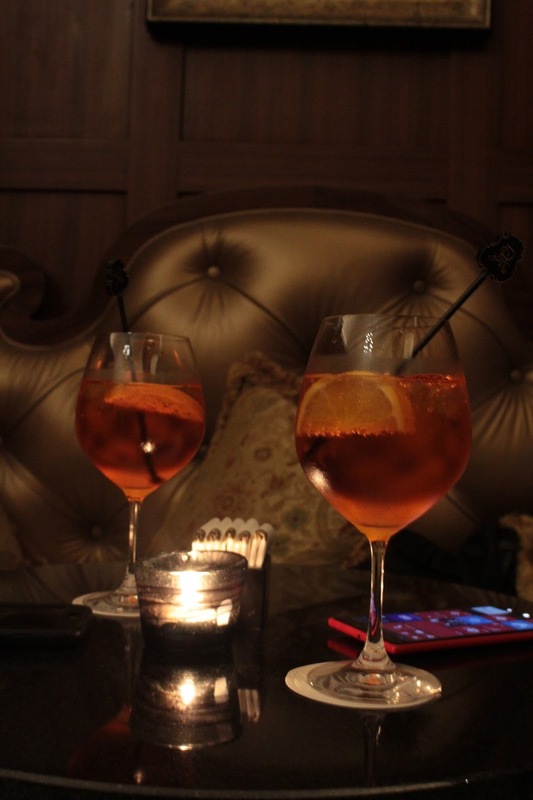 An Aperol Spritz to start the evening and great willpower on my part not to be tempted by the cheeses! After a few nibbles, we are shown to our table. On a previous visit in 2014, I wrote about the homeliness of the restaurant. No need to reinvent the wheel, so I quote it instead. I wrote: Immediately I feel I am in someone's home. No doubt. The wooden floors have a used feel to them. They could have been made using a shiny and glossy wood, but then it would seem unnatural. No, this is a villa in which people live - that is the concept anyway, and it works. Drawn curtains continue the illusion, as does a fireplace in the centre of the room. Ornate chandeliers place this villa in a specific period when it was not politically incorrect to be wealthy and to celebrate that wealth. The first thing I notice is that staff tread elegantly here - there is not the annoying clip clop that often comes when a restaurant has a wooden floor. Graceful. Almost 18 months on and I feel exactly the same way. My question this evening is how much they overhauled their concept, if at all, since my last visit. 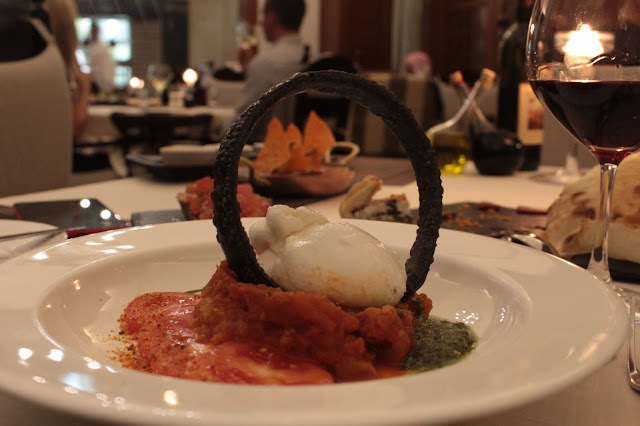 I have noticed that most of the Italian restaurants in Abu Dhabi have returned to the quintessential values of Italian dining - homely, simplicity of ingredients and sharing. Is it possible, I continue my contemplative mood, for a restaurant to be all these even though it is in a luxe setting? I seek to find out. 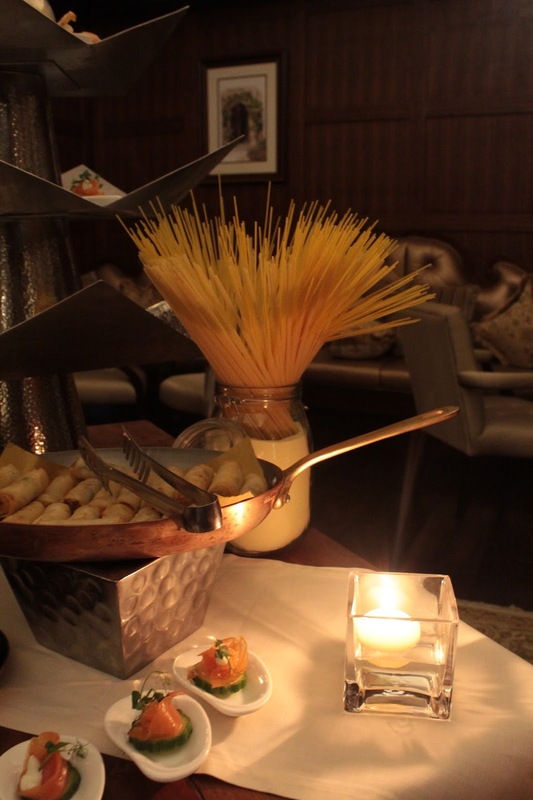 After we are seated, we are shown menus and soon after, a selection of complimentary starters is presented by Chef Stefano Viola. I understand this is standard as a way of welcoming guests, but I feel so thrilled because of the generous portions we are able to try. I am also pleased I exercised such restraint earlier. 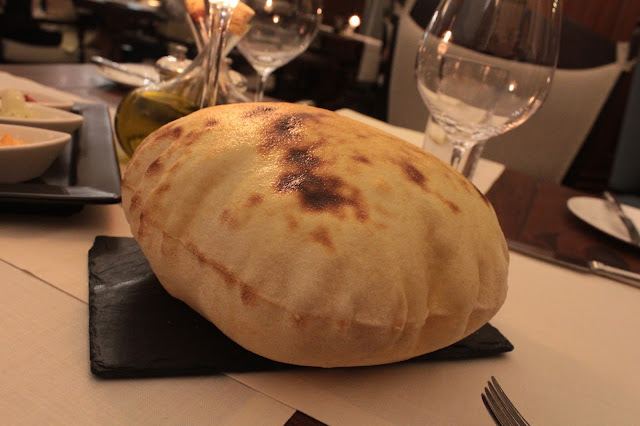 We both love the bread, a puffed up type of pita bread with the texture of Arabic bread. The Ricotta mushroom cake is rich and creamy, with a heavenly crispiness in that pastry. Next up, we have the burrata. I love it when any ingredient is cooked two ways. With the Buratta is sliced tomato, as one would expect, but the real joy is the pappa al pomodoro, which is basically a common man's dish made from bread and tomatoes. The story goes that people often had bread left over that was going stale, so rather than waste it, it was mixed with tomatoes. Crispy bread with squid ink rounds of a dramatic presentation. But it is that pappa al pomodoro that wins the heart. Not even the exquisite burrata can eclipse this. Unwittingly the dish starts to address a question I posed to myself as I walked into the restaurant - a stylish setting this may be, but the dishes can be warm and down to earth. Midway through the evening, I reflect on another strength of the restaurant - its staff. It is virtually an Italian staff with 9 of 12 hailing from Italy. That is unparalleled. It is hard to bring western European staff here, especially from Italy, so it is a remarkable commitment to offering guests an authentic experience. Does it really matter though? Of course. Would you rather be told about the pappa al pomodoro from someone who, as a boy or girl, grew up watching his or her mother prepare it or someone who has been given a training manual on this? We also have the Cannelloni with ricotta cheese. The delicate flavours show Chef Stefano equally at home with both rich, robust flavours and also the more subtle flavours. How delicate? I can taste the spinach in all its goodness. For our final bar one dish, we have an extraordinary one. My waiter talks me through it but I end up hearing half of what he says because of the dish in front of me, and again significantly, what it represents this evening. Imagine a pie with delicious pastry. That is the shell to this dish. Already I have a sense of the homeliness of this dish; the honesty of this dish. 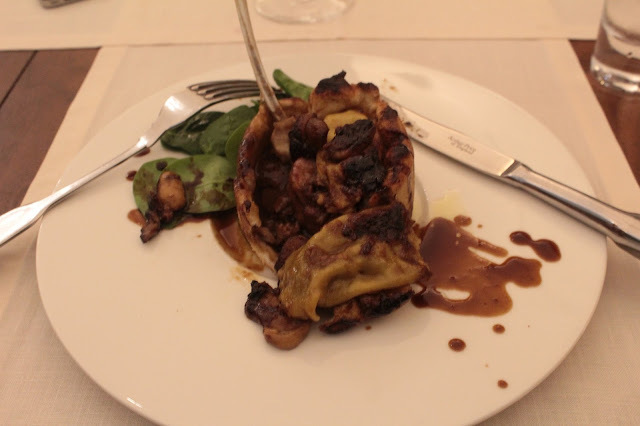 Inside is also lamb on the bone, with the bone jutting out - nothing fine about this. It has an element of keeping it real. Lamb ragu can also be discerned as I scoop in. Porcini mushrooms too. Then, and this is the delightful ambivalence that is Villa Toscana - oyster ravioli. Oyster ravioli! Chef Stefano would be so disappointed if I mentioned surf and turf in the same breath as his dish, but it does show, as I discovered last week at another restaurant in Abu Dhabi, that this American abomination in which the sea meets the land, can be a refined affair. All the cliches about the lamb are true. It is tender and succulent. Comforting food. I end up eating by hand. Is there any other way to eat meat on a bone? All in all, a dish to savour. It paired very well with my Banfi Rosso di Montalcino 2013, an intense ruby red wine rich in cherries but surprisingly soft on the palate with a long finish. In fact, as the wine we had for our dinner, it was quite versatile throughout but reached its zenith with this dish. As I look around, I see a table of 4 women, another table with a family of 5 including a 2-year-old and then I also see an elderly couple. If anyone was studying the demographics of the people who dine here, he/she would have a hard time based on this. Each table has its own story, but they are all connected by two things - words and food. There are no mobile phones interrupting conversations. No one is tweeting. And I think this is what makes the restaurant special. Despite previous thoughts to this effect, Villa Toscana is not an occasion restaurant. Although it is not cheap, it is the type of restaurant that regulars come back to. The table of 4 women, for example, looks like a group of friends out on their monthly visit to the restaurant. There is something comforting about Villa Toscana. And the villa concept is actually its strength because the restaurant looks deceptively small, but there are other 'rooms' as well which we don't see because of the layout. These musings are cut short with another highpoint of the night. 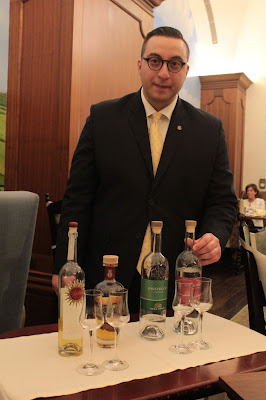 The grappa trolley is brought in and Claudio, the restaurant manager, introduces them in a very engaging but knowledgeable manner. I enjoy his conversational, relaxed tone. This standard feature at the restaurant, notwithstanding its warmth and home appeal, levels the experience. And why shouldn't it? We live in a world where we risk losing everything that involves ceremony, where t-shirts and jeans are common place and we eschew anything that is remotely cultured and civilised in favour of what I call a microwave culture -the millennials are here to stay, so this is a wonderful return to things old. 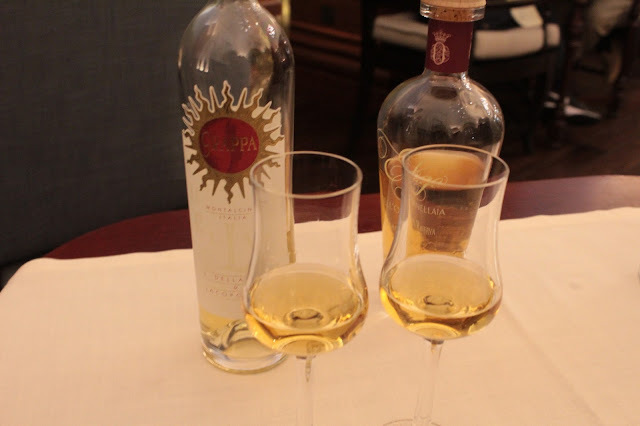 I have not quite come to appreciate grapa as I am more accustomed to the smoother less cutting taste of a Moscato, but I would not pass it up when served in this way. Dessert itself is based on a classic - tiramisu, but the presentation is what brings the broadest smile to my face. I am hesitant to use the word 'deconstructed' for fear of setting alarm bells ringing among traditional lovers of Villa Toscana, but that is what it is like. Smooth, mascarpone cream with a bit of chocolate are covered in chocolate, much like an ice lolly, with a stick at the end. Crumble in lieu of lady fingers adorns the black slate on which it is perched. Raspberries served two ways complete the dish. OMG! I appreciate the dessert on two levels - the classic tiramisu is still respected for the taste is very much there. 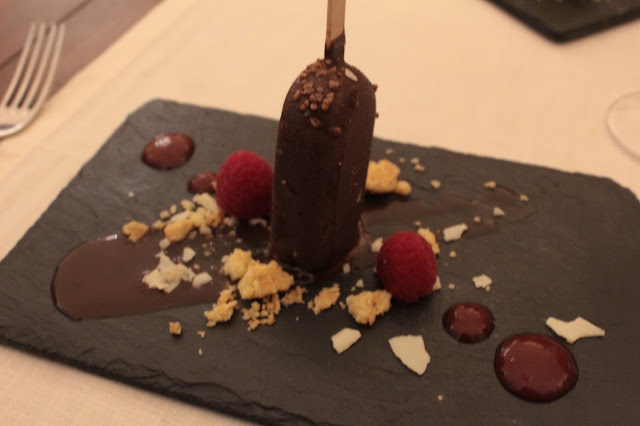 Secondly,I it is a playful dessert. It evokes something in each of us I am sure, something child-like, happy. Our personal wonder years perhaps... A dessert I will remember for a long time. Thus ended dinner. 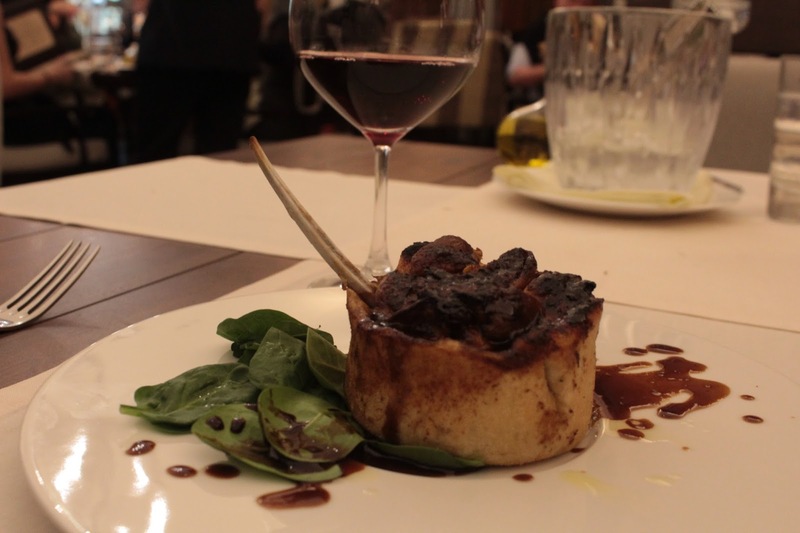 I arrived at Villa Toscana confident that I would be able to find fault with its concept, especially in view of what is happening at Italian restaurants elsewhere in the city. I came to dinner wondering why a few Italians I have met in hospitality have told me this is their go-to place for dinner. I also thought I could find the incongruence in a concept where a restaurant is housed in a fine setting but claims to be warm and hearty. I failed in all the above. It has all the warmth that you would want in an intimate, cosy restaurant while serving up hearty dishes in an elegant setting with some finer touches. Is it fine dining though? No. Does it have elements of fine dining ? Yes. It is not intimidating, notwithstanding the magnificent lobby as you enter the hotel. Keep walking, up the stairs and you will find a wonderful contradiction that is Villa Toscana. 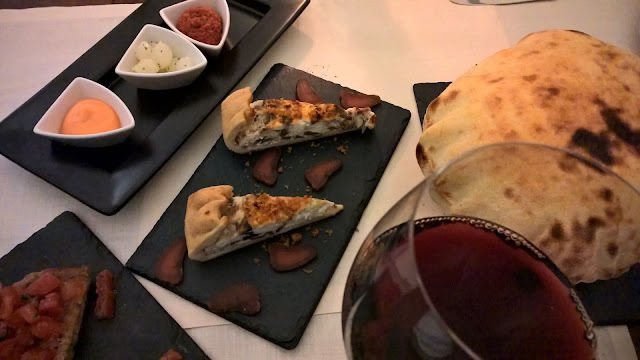 As good as Chef's food was, he will agree with me when I quote the old Italian proverb Non si vive di solo pane - Villa Toscana shows it is more than just food that makes for a beautiful dining experience here. Something I know too now. Disclaimer: I consult at restaurants and hotels in an attempt to look at the entire product to take service levels to where they should be. I visited Villa Toscana courtesy of the hotel.